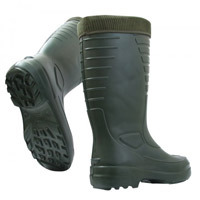 Arctic thermal boots are made from a special cellular EVA material. Rovex incorporate millions of tiny air pockets into the boot material which provides a unique combination of lightness and thermal insulation and durability which can outlast normal boots by up to 2-3 times. The result is an amazingly lightweight boot (on average 35% lighter than normal boots) which not only keeps your feet warm but greatly reduces fatigue. The boots are extremely comfortable to wear as the EVA, over time, moulds itself to your feet and stays extremely supple at low temperatures. To further enhance your comfort the boots have removable and washable fleece liners.